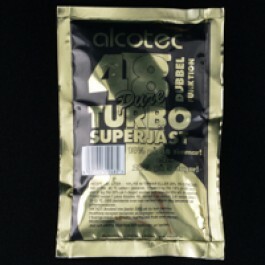 Alcotec 48-Hour Turbo Yeast is a mixture of dry distiller’s yeast and yeast nutrients designed for super-fast fermentations that produce high alcohol content. The recipes included with the 135 g package produce 25 liters with 13-14% ABV in just 24 hours, or up to 20% ABV in 48 hours. The actual fermentation looks like nothing you have seen before in home brew, it is more of an explosion. For making alcohol, there is nothing faster.